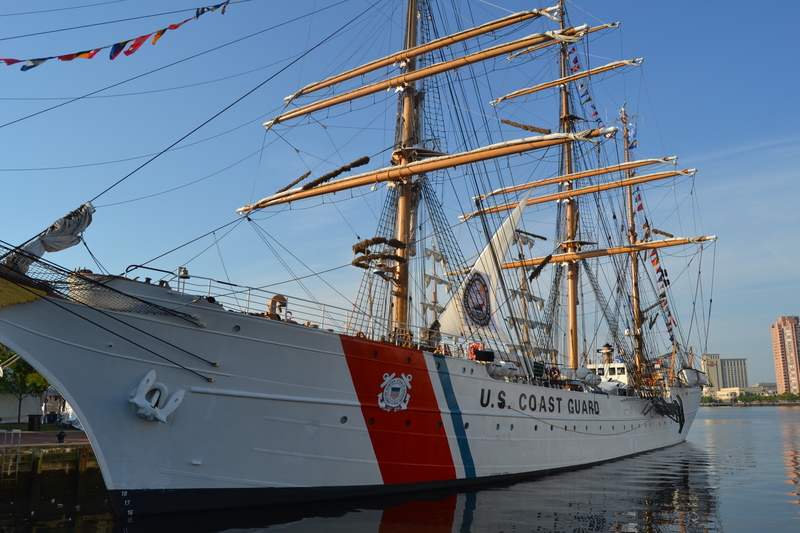 This entry was posted in Family, Traveling Days and tagged cisne branco, coast guard cutter eagle, Harborfest, mermaid city, norfolk va, opsail 2012, picton castle. Bookmark the permalink. Oh what GREAT photos! Must have been wonderful seeing all those beautiful ships together in one place. In spite of Motor Man trying to toss you in the water (!) it looks like a FUN time was had by you and your guys! Lovely photos! We were there on Thursday, before the ships came in, and it was definitely not as crowded as it was yesterday afternoon! 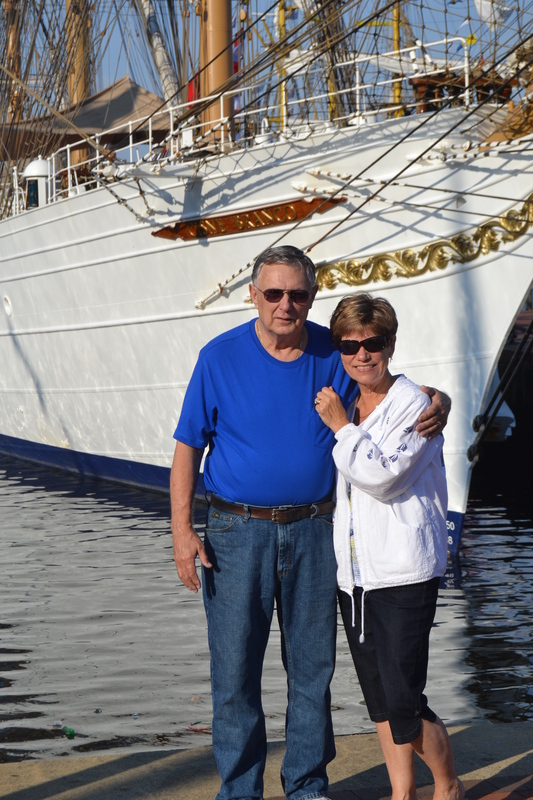 Love the photo of you and MM “playing around” on the dock! Glad you didn’t go overboard! I only took about 1000 photos between the Wednesday and Friday sailings, and the day yesterday…now to sort through them! 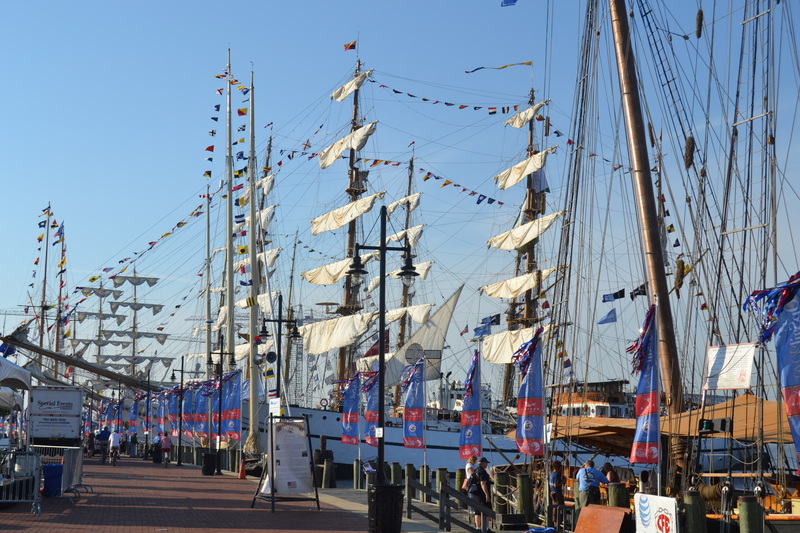 Looks like you had a great day – I love that first shot with all of those tall masts. Looks like you very nearly went for a swim there, lol. 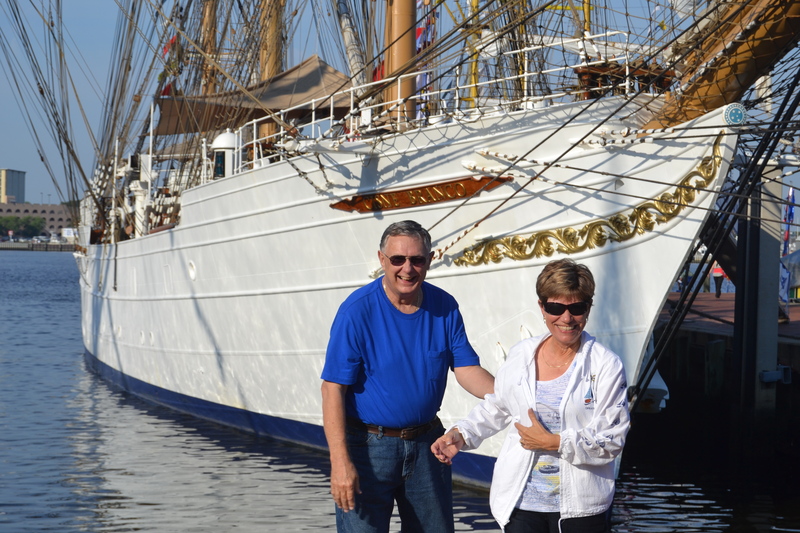 Wow, I love looking at tall ships – so neat! But the best part is the mermaid at the end 🙂 What a beautiful statue! 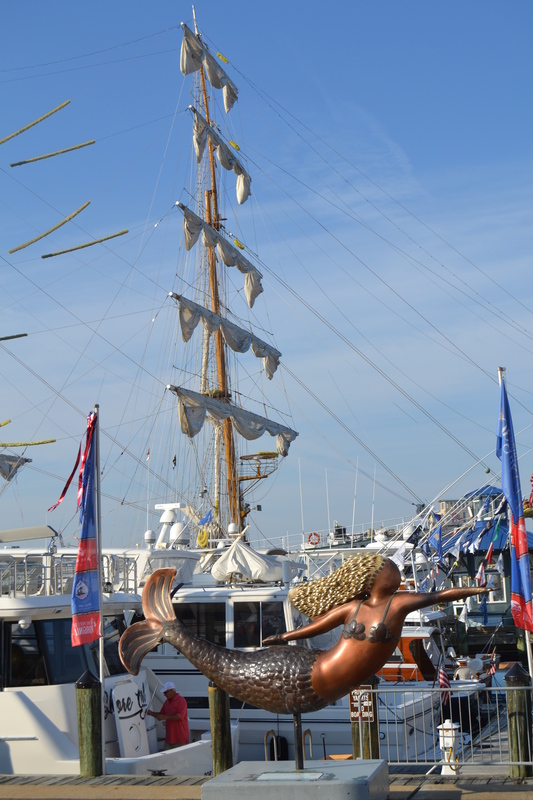 I just LOVE tall ships – they’re so … Tall! You and Marshall especially, got some great shots. 😉 Glad ya didn’t end up playing mermaid! Bad boy Motor Man! But funny. 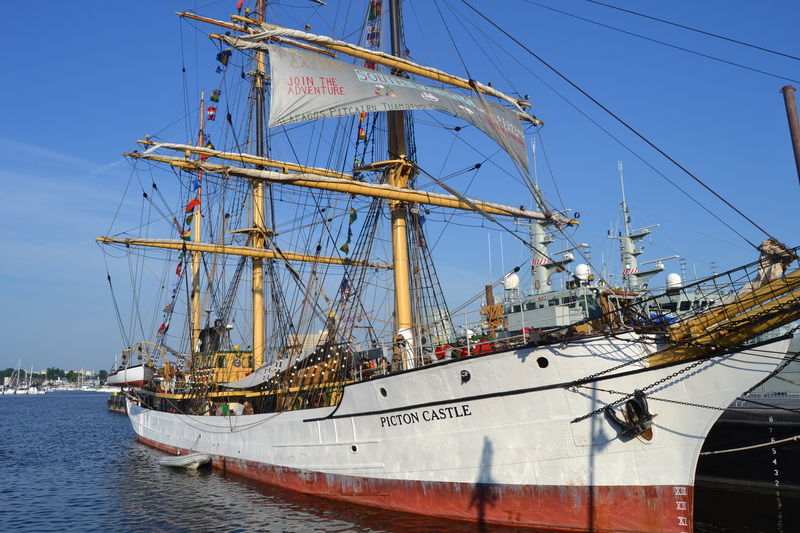 The tall ships sailing into Norfolk was a beautiful sight! And your picture with the mermaid was perfect. Looks like you almost went for a little swim! This looks like such a FUN day-thanks so much for sharing. I would give anything to be closer to the water! i like that cool sculpture at the end. glad you weren’t tossed in! 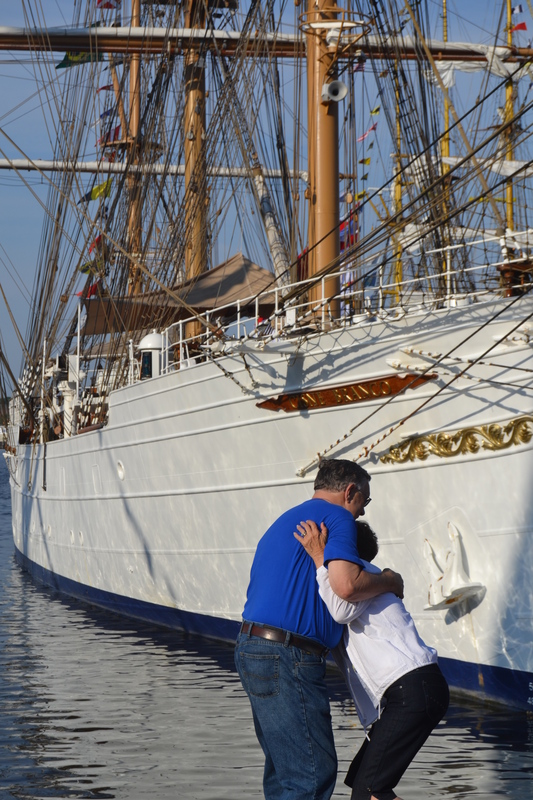 All those beautiful sailing ships must have been quite a sight! Looks like a fun day. I love the last photo with the mermaid! It was a fun morning! … & we picked just the right time to go; no crowds, and mild heat. I only wish we had realized the Kalmar Nyckel was there .. would’ve been cool to see her again 😉 Also glad you weren’t tossed in.. none of us can swim ! Oh how I miss sailing… We had a small (23′) boat as a kid and sailed up & down the Hudson. One day I’ll have a sailboat again. Thanks for the beautiful reminders Dianna. You look like a sailing gal in your sporty outfit! Nice shots – especially the one where you almost ‘went for a drink’! Looks like so much fun!! Except for the photo of MM trying to get you wet. 😉 Glad you forgave him. Wasn’t this a blast! Brett had the greats view of the event from his office window at the Naval Hospital! I was so jealous! 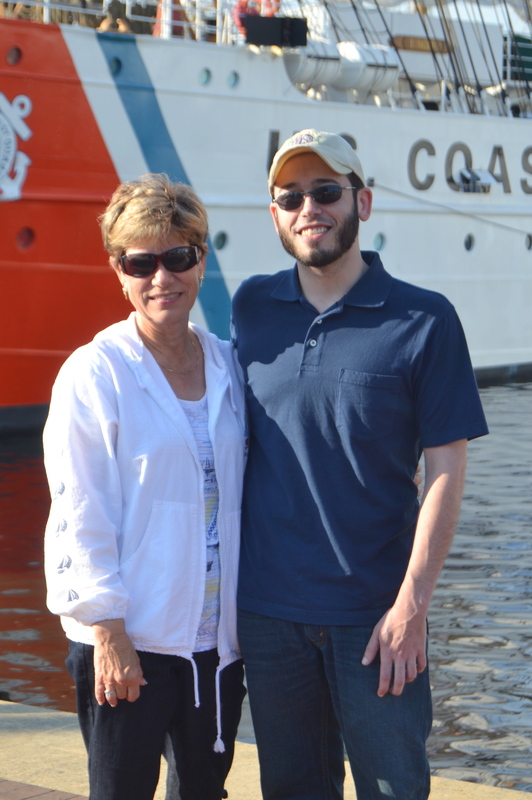 We took our first ride on the Tide to OpSail, later Sunday afternoon when it cooled off a bit. I’d love to see the Parade of Sail sometime. Glad to see Motor Man held on tightly so YOU didn’t go sailing into the water! Did you go on any of the ships? Your ship pictures were so real life like we were there.